Have you ever been to Easter Island? How about the Bermuda Triangle? Ever been confused about which is where, and whether the latter contains the former? Well, all these questions, and more, (like what do Moai like to eat most of all), will be answered in the next episode of Sam & Max, Season Two, titled Moai Better Blues. Okay, lets make an assumption here. You, the reader, have never played a Sam & Max game before in your life. In fact you haven't even checked out the Telltale Games website, or the Sam & Max comics there. As you might guess from the fact there are comics, the characters Sam and Max started life as drawings by Steve Purcell. From there they graduated to the computer games genre in Sam & Max Hit the Road some years ago... 1993 in point of fact! Since then they've been the subject of an animated television series, and now they are the heroes (I think) of two seasons of the episodic Sam & Max games. Sam is a large dog that walks on two legs, wears a homburg and an ill-fitting suit with an enormous kipper tie. Max is a 'hyperkinetic rabbity thing' (although he prefers to be known as a 'lagomorph'), but all he wears is a manic toothy grin. So, we have a wisecracking detective with an ultra-violent sidekick, who're together known as the Freelance Police. Now it's your job to use these slightly-less-than-sharp tools to crack some pretty odd cases. In earlier episodes, Sam and Max have foiled the hypnotic plans of several bad guys, gotten Max elected as the President of the USA, been digitised into a virtual reality nightmare, and visited the Moon on numerous occasions. 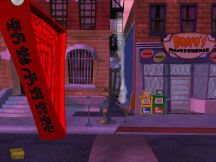 However, Moai Better Blues begins with one of the stalwart extras in the series, Sybil Pandemik, being chased by a huge red triangle, up and down the street outside Sam and Max's office. From there we have the usual locations of Sam and Max's office, Stinky's, Bosco's Inconvenience Store, and the garage run by the C.O.P.S., but somehow we've got to end up on Easter Island...and before the opening credits run. Perhaps it's about time I explained what the Moai are. The Moai (pronounced Moe-aye) are the giant carved stone statues that are such an iconic image for Easter Island (known by the natives as Rapa Nui). The bodies of many of the statues have been hidden by soil movement, and so the heads are what are normally seen. They are said to represent the honoured ancestors of the Polynesian colonisers of the first half of the last millennium - they're from roughly the same period as William of Normandy's conquest of England! Enough of the history lesson already. On with the game. Needless to say, there is a disaster looming on Easter Island - the (fictional) neighbouring volcanic island is about to explode, destroying everything on Easter Island. Moai and all. 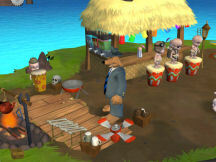 So Sam and Max have to investigate, whilst playing on a surfing simulator, writing a new big band hit tune, and making a deity out of the most raw of ingredients: Max. As if it wasn't enough that he's already POTUS! Characters wise, we have the existing cast of drop-outs, weirdos and rats (figurative and literal), plus a gallery of new characters, some of whom I would not be surprised to see cropping up in episodes 203, 204 and 205 of this season. Sybil, Abe Lincoln, Flint Paper, Jimmy, Bosco and Stinky have their parts to play, but I'll not reveal the identities of any of the new characters. The Sam & Max games are thoroughly based on the point-n-click principle. However Moai Better Blues gives you the option of using keyboard controls (left and right cursors) during the driving mini-game. You can still use the mouse for this section if you prefer. This mini-game is the only timed element to this game. Single clicking in the environment makes Sam walk to the location (in this episode, you only directly control Sam). Double clicking sometimes makes him run. Single clicking on a labelled item (if you have the 'pop-up text' option switched on) will either pick it up or describe the item. Your inventory is in the usual brown box in the bottom left of the screen. There are no inventory combining puzzles, but you can single click on an item to pick it up and use it in the environment by single clicking again on the intended target. Right click has no effect. A left click on a character causes Sam to talk to that character, with your dialogue options presented as a pop-up list at the bottom of the screen. Generally speaking, the dialogue trees are not deep, and there are few long dialogue sessions. As with all the Season One games and Ice Station Santa, the user interface is full screen (though there is a 'windowed' mode in the options), with a tab in the top left corner to bring down the simple menu (Save/Load, Options, New Game and Quit). There are unlimited save slots, including an Auto-Save. Each one saves with a picture of the current screen and a time stamp. Options include graphics quality, a wide range of screen resolutions (as listed by my graphics card), sound volumes (speech, effects and music), subtitles, pop-up text and hint level (which has five levels, from 'None' to 'Frequent'). Puzzles in the Sam & Max games are strong on dialogue choices, and the reasonably logical (though not always sane) application of inventory items to solve problems. As I've already mentioned, there is a driving mini-game in this episode, where the simple aim is to run over sets of bagpipes, but leave accordions unharmed. Personally, being married to a Scot, I'd have preferred the reverse. Variations upon the driving game seem to be an ongoing feature of these games, so some people may find it handy to have a captive child on hand to obtain that tricked-out Synthotronic Audio Enhancer (a.k.a. car horn) for your Desoto convertible. There is also an even smaller surfboard simulator mini-game. The game can be configured to provide hints. These are given by Max, and usually consist of bringing to Sam's attention some object or character in the current location, or suggesting that there's nothing to do in the current location. Most of the hints seemed quite subtle to me, until one hit me square between the eyes as one of those "D'oh! of course that's what I should try!" moments. The casting of voice actors appears to be nicely settled now, with David Nowlin and William Kasten in the title roles for the last seven episodes. Actually I can't imagine Sam and Max sounding any other way now. The rest of the characters are well voiced by the actors, in a manner that suggests they 'get' the stories in a way that other games' voice-over artists sometimes fail to do. The Sam & Max games are reliably bug-free, in my experience, so I was surprised when on one occasion, the driving game showed the car moving, but the road and background remained static. However, this did not cause a crash -- I merely had to leave the mini-game and retry. The only other problem I found was that there are annoying inconsistencies as to when you can make Sam run, and when you can't. Excluding the undersea section, where it is logical that Sam would not be able to run, there were several locations where I wanted to make Sam run (by double clicking), but he wouldn't do it. Sam & Max Episode 202: Moai Better Blues is an excellent presentation from Telltale Games, as always; the style has been maintained, and the quality remains high in all aspects of the game from music, to acting, story, and graphics. The couple of minor bugs put narry a dent in the overall picture. 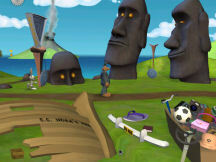 Sam & Max 202: Moai Better Blues is available on GameTap, and will be downloadable via the Telltale Games website starting January 11, 2008.